The original Assassin’s Creed was a surprisingly engaging, if flawed, product that captured the interest and attention of a fairly large amount of people. The combination of the authentic-feeling world, the interesting gameplay mechanics that felt like a cross between Spider-Man and a more fluid and playable Tenchu, and the interesting concept of flashing back between the past and present by way of a memory-animating chair made the experience a memorable one. However, the game wasn’t without its flaws, thanks to some repetitive mission objectives and glitches in design, and the end result ended up not being as impressive as it could have been. Ubisoft Montreal had their work cut out for them with the sequel, as expectations were high. Taking the series into Renaissance-era Italy made for a whole new series of challenges, between having to build a whole new world from scratch and having to design it in a way that the gameplay worked as fluidly as it did in the first. Further, ironing out the kinks in the first game would have to be a top priority, as would expanding the experience significantly to really make it feel like a sequel instead of a cash-in. With their work cut out for them, did Ubisoft manage to assemble a masterpiece of epic proportions, or is Assassin’s Creed 2 a shallow failure? So, the story of Assassin’s Creed 2 starts off about where we left off, with Desmond, a descendant of various other assassins, locked up by the Templar and basically left to rot. This ends mighty quickly, as Lucy, one of the two researchers from the first game who had been poking around in Desmond’s ancestral memories, rescues Desmond and stages his escape. After a bit of exposition, Desmond jumps into a new Animus on behalf of the Assassin’s Guild, in an attempt to essentially Matrix-train Desmond to become an assassin while digging around in his past. The Animus allows the traits of Desmond’s ancestors to bleed into him, essentially allowing him to pick up their knowledge as he re-lives their existence; thus, after poking around in a digital simulation of a dead relative’s memories, Desmond “knows kung-fu”Â, har har. 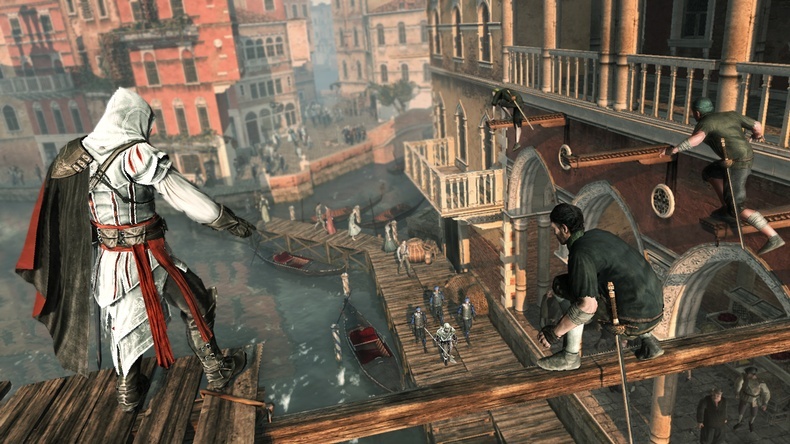 In this case, Desmond jumps into the memories of his relative Ezio (pronounced Enzio) Auditore da Firenze, following him through his life as his family is betrayed and he goes on a massive path of revenge, cutting down everyone involved in his betrayal as he slowly begins to learn about his family’s history and what his father REALLY was. The good news about the story is that it’s mostly fabulous. The game integrates the life and times of Ezio into Desmond’s existence and what this means for him well, and the slow build-up to Desmond’s eventual taking on of the hero role is surprisingly engaging. The game world is very well build and conceived, and the characters are generally well developed and have strong and believable motivations for what they do and why. The heroic characters are likable, if not “heroes”Â in the strictest sense, while the bad guys are villains in all respects, but not in that Captain Planet way where it seems like they’re evil for the sake of being evil. That all said, Assassin’s Creed 2 changes pace a good bit theologically, and this is going to be a big sticking point for a lot of players. The topic of God and religion is addressed and delved into in this game, and some significant revelations are made throughout the game that may not sit well with those of you who take your religion seriously. This isn’t meant as a Shin Megami Tensei warning, mind you, as the game isn’t openly blasphemous or anything, but if you take your religious beliefs seriously and don’t care for alternate explanations of the nature of God/Allah/Vishnu/Odin/Zeus/Ra/whatever, you… might want to reconsider your purchase. I mean, the big reveal, as it is, isn’t exactly fresh and different (I can think of about ten movies that have done something similar), so you’ve probably seen something similar, and the big reveal WORKS well enough that it you won’t even care that you’ve seen it before, but… well, my Christian friends were none too pleased with the revelations in the game, so let us simply say “don’t say I didn’t warn you”Â and move on with our day. On the other hand, the game does a whole lot with historical figures, to great effect. Your allies include Leonardo da Vinci, Caterina Sforza, and the Medici family, and you are opposed by the Pazzi family and Rodrigo Borgia, because nothing says awesome like HAVING TO TAKE ON THE POPE. The game does a lot of fantastic things with the setting, incorporating historical events and figures into the game in a fashion that actually works out well, and anyone who is a fan of Renaissance history should love the story for that reason alone. Personally, I thought it was awesome when Niccolo Machiavelli showed up as one of your allies, but maybe that’s just me. Assassin’s Creed 2 looks fantastic, thanks to a large amount of attention to detail. Renaissance Italy looks fantastic and very much as you’d expect, between the towering majestic buildings and the artistically designed locales, and the environment and characters are designed in a very authentic fashion. The characters are quite well rendered and animate fluidly, lending a solid credibility to the various action sequences in the game. The game also makes great use of lighting and fire effects, and the digital Matrix-esque effects that pop up throughout the game provide an interesting and attractive contrast to the experience. There are some odd glitches when NPC’s try to climb walls occasionally, however, and some clipping pops up here and there, which hurts the visuals a little bit, but for the most part the game looks great. Aurally the game is epic in every way, starting with the outstanding soundtrack, which has a very ethnic flair to it and seamlessly changes based on the mood of the moment. 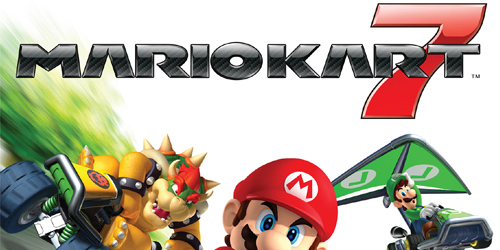 The voice acting is very authentic sounding and generally quite good all around, and while the game predominantly is voice acted in English (for the benefit of the player, presumably), the characters periodically break out some Italian to add a little personality to the proceedings. Also, in a nice touch, they’re actually pretty good at it! So kudos for that. The sound effects are top-notch, as combat sounds exciting and powerful, the various and sundry ambient sounds bring the experience to life, and Ezio smacking into the pavement after a long drop sounds rather painful. Assassin’s Creed 2 plays more or less identically to the first game, so fans of that will be right at home with the experience. Assuming you’re new to the series however, the game can best be described as one part Grand Theft Auto, one part Tomb Raider, one part Tenchu and one part Ninja Gaiden. 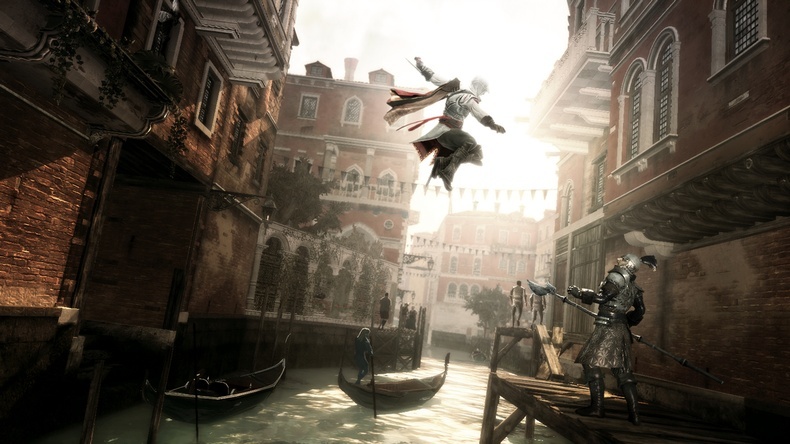 Ezio is controlled with the left stick while the right stick moves the camera, and the various face buttons allow him to interact with the environment, attack and jump around. Holding down the right trigger allows Ezio to run instead of walk, which is his default movement speed, while holding down the left trigger locks on to whatever Ezio is looking at. Ezio can climb any surface with sufficient hand and footholds built into it, be they cracks, grooves, ledges or other such things in addition to walking around the city. Rather than making the climbing and jumping mechanics colossally complicated, however, Assassin’s Creed 2 simply asks you to hold down the right trigger and A at the same time, which allows Ezio to free-run. In this state, he’ll basically try to move through whatever is in his way at the moment, by jumping to the next available platform (if one exists), scaling the obstacle before him (if it’s possible), or otherwise attempting to bypass whatever’s in his way at the moment. This dramatically simplifies movement, as you can simply aim Ezio in the direction you want him to go without having to manage multiple buttons to properly direct his movements; simply hold the buttons and Ezio will take care of the hard parts. This doesn’t actually make the jumping puzzles any easier, mind you, as figuring out how to get to a location can be fairly taxing, but by removing the need to fight with the controls, the experience ends up a lot more fluid as a result. Assassin’s Creed 2 has plenty of its own tricks to add to the basics, however. First off, Ezio can kick in Eagle Vision when you hold down the Y button, which essentially renders the world in a semi-digital blue hue, allowing you to focus on objects of importance. Enemies and allies will be highlighted in obvious colors, allowing you to identify them easily, and hidden markers and glyphs will pop up in this mode, allowing you to hunt them down. This plays into a new elements of Assassin’s Creed 2: Subject 16. Subject 16 is apparently another assassin who had been abducted by the Templars and strapped into the Animus, but at some point during his captivity he began hacking into the Templar files, and the clues and evidence he found are left for you as Ezio to discover. By scanning the markers left in Ezio’s memories, you unlock puzzles to decipher, which in turn unlock more information about what Subject 16 found through his research, which the game terms as “The Truth”Â. To say the concept and mechanic are interesting is, frankly, an understatement; the way everything is implemented is outright cool, and it’s a neat way to integrate the futuristic elements of the series instead of simply focusing on the past at all times. Another interesting element that makes its return from the first game is the way in which you unlock your view of the overhead map. Ezio doesn’t simply know the layout of the various locations in Italy, so at first, any area you walk around in will be obscured by digital noise. To clear up the noise and see the map, you’ll have to Synchronize with the environment, which is accomplished by climbing to the top of specific tall objects and pressing Y. Ezio then proceeds to look around the environment, complete with a nifty circular pan of the area, and then the map is updated with what Ezio has seen. In the beginning, this simply outlines the city streets and facilities one can find along them, but as things progress, you’ll be able to find Codex pages and other useful and hidden items with this simple action, making it vital to Synchronize with the area whenever you’re presented with the option to do so. Of course, the game isn’t all puzzle solving and climbing around, and sooner or later Ezio will be expected to live up to his role as an assassin in some form or fashion. Assassin’s Creed 2 offers you the option of engaging in battle with either your bare fists (yeah, right), the wrist-mounted assassin blade, a melee weapon of some sort, or projectiles, depending on your needs at the moment. You can switch between your equipped weapon by holding the right bumper and selecting your choice from the radial menu that appears, allowing you to change weapons on the fly as needed, as each one has different positives and negatives in battle. Pressing X allows you to attack enemies, either with attack combos, thrown items, or when approaching an unsuspecting enemy with the assassin blade, by shoving the blade into their sensitive bits from numerous different positions. Indeed, assassination is a significant part of the game, and fortunately, you can do it in numerous ways, whether from behind, from the front, while hanging from a ledge (complete with throwing the victim off the ledge), while leaping from an obstacle and other fun and exciting ways. 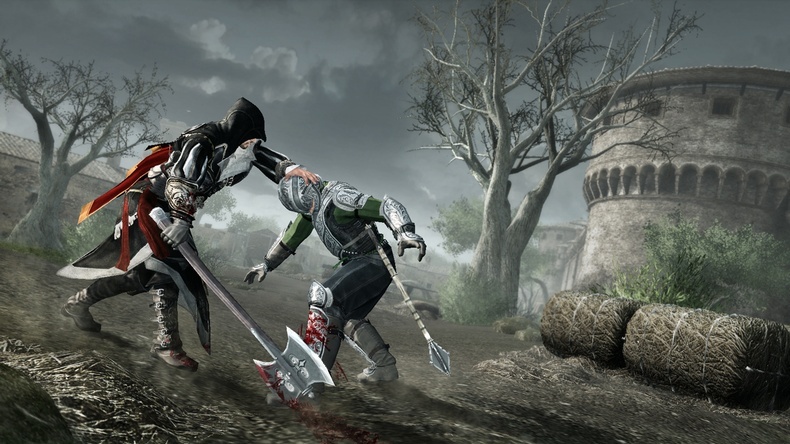 Ezio has five choices of weapon type to employ in battle, depending on his needs: his fists (again, yeah, right) are good for non-lethal actions and allow him to disarm enemies; the assassin blades allow for one-shot kill counters, but are weak in combat; the small weapons are fast but weak; the larger swords and hammers are stronger but slower; and ammunition-based weapons, like throwing knives, smoke bombs and even A WRIST-MOUNTED GUN OH YEAH have their own practical uses, but aren’t always useful. 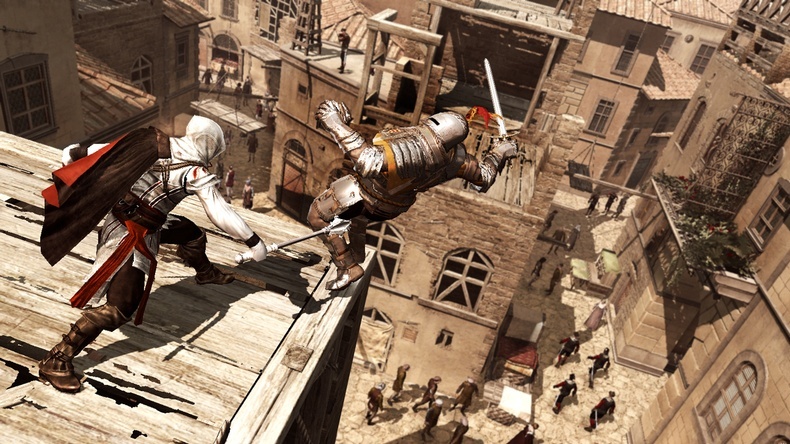 Ezio can also dodge, parry, counter and taunt enemies in battle, depending on your needs at the moment, and the mechanics of battle are generally well-developed and work appropriately. 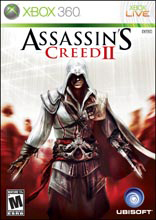 Most of the above mechanics and concepts were present to varying degrees in the prior game, but Assassin’s Creed 2 improves and adds to the experience further, helping to improve the experience significantly over its predecessor. The original game was accused of being a bit repetitive, as the player often took on the same types of missions over and over again, but that isn’t the case here. This time around, the missions provided to the player are a good bit more varied, and can range from assassinations and spying missions to thievery, scouting missions, timed races, beat downs, message deliveries and more, as the situation merits. There’s even two missions that involve using Leonardo da Vinci’s flying machine to assault an impregnable fortress and one assassination that asks you to take out a politician with your pistol during a fireworks show to avoid detection. The game is a good bit more varied in what it asks of you and how it allows you to accomplish things, giving the game a more interesting feel than its predecessor and making for a more varied, interesting game all around. The other significant changes made to Assassin’s Creed 2 revolve primarily around expanding the experience, making it into a more fleshed out product that gives the player a significant sense of doing something for a reason beyond storyline advancement. For one thing, Ezio earns money for his accomplishments, as well as by robbing people, pillaging treasure chests and beating up thieves and couriers, which can then be invested into any number of various upgrades and improvements. You can buy a fairly large amount of improvements and changes for Ezio himself, including better small and large weapons, better armor, and larger pouches for healing items (Ezio doesn’t regenerate health like Altair did, meaning healing items are a necessity), knives and bombs. You’re also given a personal home town of sorts, Montenegro, which you can improve from a crappy run-down slum into a grand jewel of Italy by investing money into the facilities. By improving the town with monetary investments and collecting various items to improve the value of the family mansion, the town generates larger amounts of income, which Ezio can then collect to further improve himself and the town. There are also all sorts of things to collect and unlock, including feathers, Codex Pages, treasures, and assassin seals which unlock the Armor of Altair, which is about the best armor in the game. As such, you’ll have plenty to play around with aside from the story missions, if you’re so inclined. The game itself can be completed in about ten to fifteen hours, depending on how much time you spend finding hidden items and completing side missions. Aside from earning various Achievements for completing missions and such, there’s limited reason to go back to the game after completing it the first time, as there’s no “New Game Plus”Â, no online component, and no additional difficulty levels to take on. The game does allow you to jump back into the Animus once you complete the campaign, however, allowing you to go through and find all of the hidden goodies you might have missed during the story itself. You can also unlock some things through Ubisoft’s new UPlay service, which allows you to earn points for earning different achievements, which can in turn be used to acquire a 360 theme, a larger knifebelt, a new costume for Ezio and a secret tomb of his ancestors, basically by accomplishing normal tasks throughout the game. There are a fairly large amount of non-essential missions and collectibles to acquire if you want to massively increase your cash or jack out your family mansion, if you’re the sort of person who loves one hundred percent clears, and the various side missions you can take on are fairly entertaining. Going through collecting every item and completing every mission could conceivably up your play time to around thirty to forty hours, depending on your ability to find hidden stuff, which is actually pretty impressive for a single player action game, and this pretty much should justify purchasing the game alone for anyone who’s looking for a fun, lengthy game. Unfortunately, while Assassin’s Creed 2 is certainly more than a fresh coat of paint on an old game, it’s still not without its share of problems. The enemy AI is iffy at times, for one; I can understand that multiple enemies might not want to assault you at once (especially after they see you counter attack someone and end him instantly), but watching NPC’s jump into the water after you KNOWING that they’ll drown or watching them jump off a roof KNOWING that they’ll die is bizarre, to say the least. 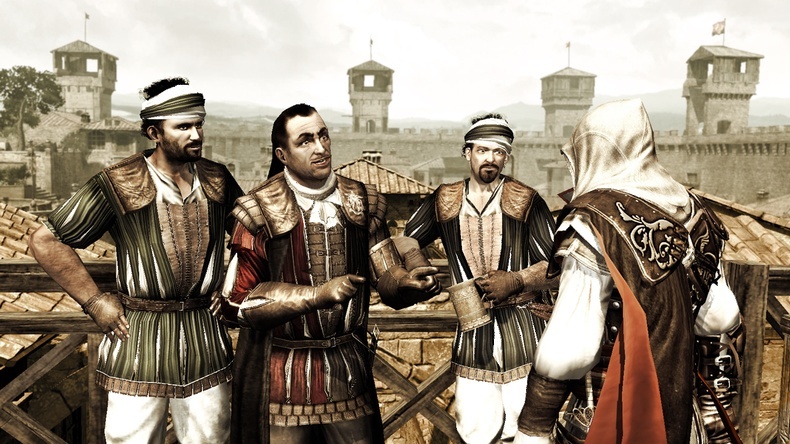 It’s also kind of annoying that, in order to complete the game, you have to gather up all thirty Codex Pages and unlock Altair’s armor IN ADDITION TO completing the storyline missions, as the former could simply have been integrated into the core game without forcing the player to hunt around Italy looking for them, while the latter provides no real benefit to the player unless one grabs it early. You can unlock Altair’s armor by Sequence Nine, a mission or two before you can unlock the best armor that can be bought, and Altair’s armor never needs to be repaired, but it’s functionally identical to the best armor you can buy, and the game never gives you a reason that you NEED to unlock his armor except to pad the game out. Further, while it’s nice that the game shows you all of the remaining Codex locations once you get to the last mission, only my collection-oriented OCD made the final Codex Page round-up bearable, as I’d found all but one page by the end; for the player who doesn’t bother collecting ANY of them, finding out that you have to collect something around twenty five pages of the Codex before you can see the final sequence of the game may be too much to swallow, so, yeah, if you intend to play the game, make sure to grab them early. Allowing the player to collect things is fine, but FORCING them to do it isn’t fun, guys. Beyond that, the game is a bit on the easy side. You’ll most likely never die unless you throw yourself off of a high platform and splatter yourself on the pavement, as combat isn’t too hard, and I managed to fight off what can be described as small armies of enemies with little effort. Counters can instant-kill enemies, Ezio can carry around fifteen healing items by end-game that kick in instantly and almost refill your entire life bar, there are few boss battles, and most enemies simply can’t hope to stand up to you in battle. This isn’t a big issue by itself, but the lack of multiple difficulty levels would have made the game more exciting for skilled players looking for a challenge, as this game mostly won’t provide one. The controls are also spotty in a few instances, most commonly during jumping puzzles. Directing Ezio to make carefully timed, planned jumps is often simple enough, but when you’re racing against a timer you’ll find Ezio to be less responsive than you’d like as he accidentally runs up a wall or jumps three inches to the left of your target and falls to his death. This isn’t frequent, and it doesn’t ruin the experience per say, but the first time it happens it’ll definitely be a bit of a notable annoyance, and later on when timed jumping puzzles become more consistent it’ll be outright frustrating the first few attempts. By and large, Assassin’s Creed 2 is worth purchasing, as it does pretty much everything better than its predecessor and offers up an experience that is varied, vast, atmospheric and fun. The story is interesting if at times polarizing, the visual and aural presentation are mostly outstanding, and the gameplay is mostly strong and significantly improved over the prior game. There’s plenty of variety to the game, the new additions to the game such as the varied mission types and the upgrades in place are excellent, and you’ll find yourself dumping plenty of time into the game just because it’s a lot of fun. However, the enemy AI isn’t especially bright at times, the game forces you to spend hours collecting items when it could have made them optional or integrated them into the story, there’s not much of a challenge to the game, and the agility-based game mechanics occasionally go wonky on you. To say that the game isn’t fantastic would be untrue, for Assassin’s Creed 2 is a more than worthwhile game all things considered, but some simple additions or some more in-depth play-testing would have made the game the best of the year instead of simply a solid, if imperfect, contender for that title. Fans of the genre or the series have absolutely no reason not to pick this up, as the flaws do not diminish the overall the experience, and only the largest haters of this sort of genre should leave the game unimpressed. Assassin’s Creed 2 makes great strides of improvement that make it far and away a better game than its predecessor, and while some small issues here and there hurt the game more than they should, the experience is still a strong one. The story is outstanding and full of cool moments, the visuals are attractive and pleasant, the audio is expertly done and amplifies the experience, and the gameplay is mostly easy to pick up and functions exactly as you’d expect. The missions feature a good bit more variety than the prior game offered, and a significant amount of depth has been added to the game, between the money system, the various upgrades available, and the numerous collectible items one can find that provide notable improvements for collecting them. However, the AI is not that bright at times and can occasionally get itself killed for stupid reasons, the game expects you to devote time collecting things in addition to completing story missions when the collecting could have been integrated into the story itself, the game isn’t as challenging as one might hope and offers no additional difficulties, and the jumping mechanics can occasionally be spotty when you’re in a rush. These issues, though they do hurt the game, do not prevent the experience from being a memorable one, and anyone who liked the first game or these sorts of games in general will have a lot of fun with this. Assassin’s Creed 2 is one of the better games released this year, and it’s easy to recommend, despite its issues, as the good points far outweigh the bad.